Last night's World Series Game Six, already being called one of the best and most historic World Series games--if not overall baseball games---of all time, has bleary eyes across the country this morning. Amazing comebacks by both teams. But for Indians fans, this seemed very familiar. Neftali Perez, the Rangers closer who hadn't given up a run in a LONG time, had the Cardinals down to their final strike, down by two, and the outfield playing as deep as you can play without buying a ticket. And yet he pulls a Jose Mesa, giving up a game-tying triple to hometown boy David Freese over the confused defense of right fielder Nelson Cruz. That, of course, was only the start. Josh Hamilton homered in the tenth to put Texas ahead, and the Cardinals went down to their final strike again. And again came back to tie. 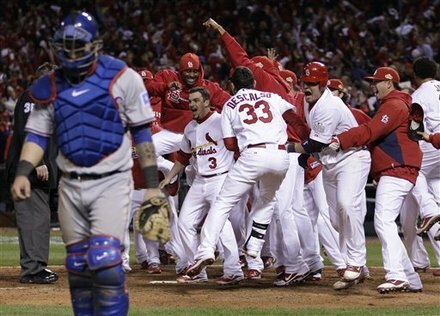 And then David Freese came up in the 11th inning again. And I don't think St. Louis has come down off that high yet. I'm sure every Indians fan over the age of 16 thought immediately of Jose Mesa. And if the Cardinals could have brought Freese home from third base in the ninth, that would have been apropos. Sure, it's not Game 7, but still, the Rangers had one strike to go. But fortunately for Perez, he won't be the only goat in this loss. The Rangers managed to blow saves in the sixth, ninth and tenth innings, and then, of course, gave up the game winning home run in the 11th. Unbelievable. Of course, like the 86 Red Sox, the Rangers have a chance to redeem themselves tonight in Game 7. Whether they can come back from this game is left to be seen. By the way, Texas has played 46 games without consecutive losses. So don't weep for them yet. If you even could.